WHAT IS Terry Naturally Thyroid Care? Terry Naturally is a brand of nutrients and vitamins founded by Terry Lemerond. They currently have over 400 unique formulations. One of these supplements is Thyroid Care. Terry Naturally Thyroid Care states it can provide support for healthy thyroid, enhance metabolism, promote breast health, and support immune function. Certainly a lot of claims are made by Terry Naturally… Let’s see how if the formula lives up to the claims. Besides the outdated website, we decided we should see how this supplement works. Sometimes you can’t judge a book by its cover. As with all supplements, it is important to look over the ingredients on the Nutritional Facts label. 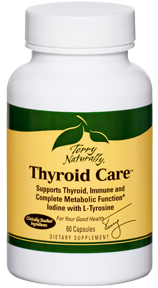 Terry Naturally Thyroid Care contains only the most basic essentials: Iodine and L-Tyrosine. Iodine is certainly important to healthy thyroid functionality – perhaps the most important of any ingredient. In Terry Naturally Thyroid Care, Iodine comes in three forms, including potassium iodide, sodium iodide, and molecular iodine for thyroid hormone synthesis. It’s worthy how much Iodine is actually in this pill. The supplement facts sheet states that there is 30 mg of iodine in one serving size. That’s 20,000% of the daily recommended value! Online research seems to suggest that this is a dangerously high amount. 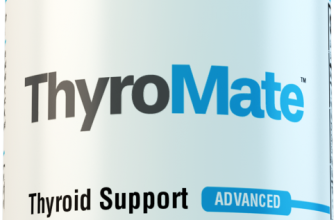 The second ingredient is L-Tyrosine, which is also essential in Thyroid health. There is 400mg in one serving size, which is near the amount that we should take. Not all thyroid issues stem from just iodine and L-Tyrosine deficiency. As many articles and research papers point out online (here’s one I found in two seconds on Google: http://chriskresser.com/the-role-of-vitamin-d-deficiency-in-thyroid-disorders/) , other vitamin deficiency can lead to your thyroid not functioning as well as it should be. It’s strange why Terry Naturally only decided to put two ingredients in this. Although we ranked Terry Naturally Thyroid Care to be pretty low, we decided to see what other people were saying about this supplement. There seems to be a good amount of negative reviews about Terry Naturally Thyroid Care. According to reviews on Amazon, it seems to have no effect on a good number of people and for others, it seems it may have actually made them feel ill. Of course, every individual is unique, and those could be outlier situations. But, there do seem to be a number of people it has not done much for. When compared to the other leading thyroid support supplements available out there on the market, Terry Naturals Thyroid Care doesn’t really cut it. Based on what we’ve experienced with it, we can’t really recommend it. These results suggest that excessive consumption of iodine in the United States may be responsible for the increased incidence of autoimmune thyroiditis. Animals with excess iodide intake, however, show an aggravation of the autoimmune inflammatory activity. Iodine and thyroid autoimmune disease in animal models. In general, iodine deficiency attenuates, while iodine excess accelerates autoimmune thyroiditis in autoimmune prone individuals. WOLFF-CHAIKOFF’S EFFECT: The thyroid gland has a capacity to reduce thyroid hormone production in the presence of excess iodine by reducing the organification of the iodine. Patricia, not sure if you’ll get to see this but, now almost a month later, do you still feel as good on this Thyroid Care? Do you get regular blood work?For you to go off your prescription, where are your levels now? are way out of range I think will have a lot more issues trying this. Mary R.
Do not recommend for someone with a sensitive stomach. + PROS: Helped with my problem. - CONS: Very hard on my stomach, which got worse after taking it for several weeks. Had to stop taking it. Looking for another product. will this affect thyroid tests? Hopefully it improves your thyroid functionality and thus your thyroid tests! I started taking Thyroid Care all most a month ago my question is I have autoimmune disease (ms) n I was wondering if its safe I have half thyroid n can’t loose weight so I was told this would help I played 58.00 for 30 day supply I see where its not making me fuel any better. This thyroid supplement contains a lot of iodine which could potentially make those with hashimoto’s feel worse and even lead to flare ups. Any updates from anyone that was taking this? Any updates from anyone that has been taking or has tried this? Anyone with hashimotos that tried it?